There is no Pauline. I made that up. There used to be a radio show way before my time called "The Perils of Pauline." I think Pauline was one of those shrieking women who always got kidnapped by a long-moustached Evil McSnead who tied her up over railroad tracks. I think each episode ended in a cliffhanger, and began with Pauline being rescued by a do-gooder type until she got in trouble again. My potluck last month was kind of like that. The cliffhanger part was that each day I wasn't sure if anyone was going to come to it. While I have been to many potlucks on Maui, I have not hosted many gatherings because our parking area is so small that to have more than 2 or 3 people over if they are not all in the same car is near impossible. Our driveway is so long and narrow that the only parking is on the street, and the street is kind of hilly. Technically, it's called a flag lot, defined with the driveway being the flag post and our "yard" being the flag. So it would require a serious person who was willing to park at a distance and walk, probably in the rain since it rains in Haiku, trying to hold a potluck dish without getting it wet, stumbling along with a cell phone flashlight down a dark and narrow driveway. I entreated a friend, Suzanne Frew, to host it at her house in Kula which has ample street parking and is big enough to host more than 2 other people. Then we tried to schedule it, the tricky part, since Suzanne's schedule is like a moving target - if you see Suzanne today, could she be on a plane tomorrow? Does Suzanne know where on the planet she'll be tomorrow? We did manage to pin down a time and date, and then had to "repin" it since the target date moved. I almost called this post, Potluck Disaster Planning, because Suzanne is a disaster planner, meaning not a planner of disasters, but a planner to prevent and manage disasters, and because this potluck was potentially a disaster in the planning. Then the next thing was to invite people, and this is where I made a very big mistake. Never rely only on social media to invite people to something, unless it's something that you can invite so many people to (like hundreds) and statistically expect a small percent of them to actually respond. Not a great RSVP rate! 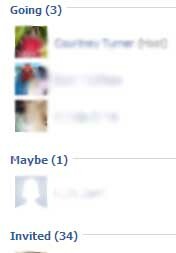 Lesson 1: Don't rely on Facebook. Lesson 2: Don't rely on Facebook. Lesson 3: Don't rely on Facebook. Did I say that enough times? I found out that most of the people I invited don’t check their Facebook account enough, don’t read the email invitations or notifications from Facebook, and don’t look at the event reminders in the upper right corner. Even if they had seen an event reminder or notification, they get invited to so many events on Facebook, mostly by people they don't know, that they totally bypassed it. I might as well have written my event invitation in Swahili, stuffed it in a bottle, corked it, and floated it in the ocean. It would have been as effective. I knew that Maui people tend to be not terribly responsive, so I wasn't too worried, but it did seem odd that I was getting no response. I figured that most people didn't want to "commit" to an event, because "committing" to something is not a Maui kind of thing to do. People like to be free to show up, or not show up, or show up very late. Spontaneity is a very Maui kind of thing. Still yet, I was getting concerned. In fact, the day of the potluck, I randomly called and emailed a few people and then found out that they didn't get the invitation. Or said they didn't and didn't want to hurt my feelings. Suzanne later said that Maui people are flaky about invitations - she also sends emails and calls people. Another friend says that phoning is best. Ah, who knew? Not having enough food - would there be enough food at this potluck? Or enough types of food? The worst potlucks I've been to, have involved food running out. People who arrive on time get food, and other people don't. My cliffhanger thought the day of the potluck, was that I knew there'd be plenty of meat for carnivores and salad, but would there be anything else? Was this going to be an Atkins type potluck? Protein, no starch, 1 veggie. People show up too early or too late - Most Maui people are notoriously late for events. To get around this, just list the event one hour before you actually want people to show up. But occasionally newer people from the mainland or other super organized types might show up early. Eek. Scurry around trying to clean house, prep food, be social. Not enough parking - this part was handled. Parking is also tricky for people in condos since guest parking is often limited, and people have to walk in. Directions and getting lost. This can happen because sometimes people give an address BUT they do not live in the main house, they live in the ohana (little cottage) behind the main house, or in the driveway around the corner of another house. Or sometimes there are several little cottages at one address, or there is an upstairs unit and a downstairs unit and a unit around the side, so which door to go to? (hint: look for piles of slippers outside the door and listen for noise.) Sometimes two mailboxes have the same number. This really happens. Or, the mailbox and address number are across the street and the house is on the other side of the street. Or the directions involve counting the number of mailboxes and following directions which only make sense if you get them from the host but are not correct if you put the address in google or mapquest. All of this difficulty is multiplied if it's dark outside. Hmmm... which mailbox for which house? Not enough plates, cups, utensils - could happen if there are extra people who show up. Sometimes people invite other people, even if the event specifically invited only a few people. Not enough people - hmmm, where have I heard this before? Too many people - and too loud, and the neighbors complain, and also, some people are wasted and end up sleeping overnight. Not so much a potluck as a part-AY. Wrong people - it's a small island, so you could run into your ex-boss, ex-girlfriend or ex-boyfriend, or ex-BFF. Wrong kind of food or food issues. Going to a potluck and not being able to eat anything because of one’s diet. Like being vegetarian or vegan, or gluten free, raw food only, or soy/nut/dairy allergies. Every kind of food preference/restriction exists on Maui, and some people have two or more. In this case, you can't cater to everyone - hopefully they will bring something they can eat. I tried to make this a gluten free potluck to accommodate three gluten free friends, none of whom managed to come, so I wouldn't make that extra effort again unless I had a guaranteed rsvp, something very rare on Maui. Potluck behavior. This is a tricky one... At one Thanksgiving potluck, one of the people who was on the clean up crew ended up throwing food away, what other people had brought. This was sort of distressing, since this was a potluck where people usually take home their food leftovers, not a first date where people are trying to impress each other by not taking home doggy bags. Sometimes people also have a little too much to drink and then are very, very sociable, especially sensitive single new age guys. Often I tell people, "Don't hug me," and this always raises eyebrows, because Maui is a hug capital of the world, but some hugs are just not appropriate. Misplacing items and losing shoes. Yes, this can happen anywhere in the world - people can leave potluck dishes or spoons or personal items behind and then you have to track them down. The funniest and strangest potluck I've been to was on Oahu at a 60th birthday bash, and the next morning the host had all sorts of personal items that had been left behind, including underwear, pants, pipes. It was a hell of a party. More commonly, though, if there are a lot of people at a potluck, there are a lot of shoes and slippers outside the door, since it's customary to not wear shoes inside someone's home. Some shoes look alike. You could end up with someone else's "mo' bettah slippahs" ("more better slippers") and they could end up with your ratty pair. If you have shoes you care about, tuck them away in a corner so you can find them easily and so no one else takes them by accident. Typical scene outside a potluck: slipper frenzy. Anyhow, Pauline's perilous potluck turned out fine. The potluck was rescued not by a lot of people, but by the right people showing up. 9 is a good number. Since there was a nostalgia photo-sharing component, this worked out well, because it would have taken hours if more people had showed up. And I learned more than I wanted to know about the perils of using Facebook to handle event invitations. For years, I didn't know the name of this derelict home at the edge of Baldwin Beach. It was just the "abandoned mansion," a very swanky looking structure on the far right of Baldwin towards Paia. One rumor was that the County of Maui revoked the permit for the house during construction or shortly after. The Montana Beach House, which graced the east side of Baldwin Beach for years. The Montana Beach House is the folly of Baldwin Beach. A folly is an extravagant building or structure built on a whim or as a conversation piece, especially popular in old England. It looked like a whimsical playhouse for adults, the perfect place for an all night beach party or for romantic kisses by the sunken hot tub filled with sand. More art graces this abandoned beach structure. Over the years, it has been covered with some of the most intriguing graffiti (or outdoor art) on island. While some people wanted to see it converted into a youth or community center, others wanted it removed. Things take a long time to play out on Maui - so it's been at least a decade of back and forth hand-wringing. Just a few days ago, the County voted to tear down the beach home at taxpayer expense. Zebra art riddle at Baldwin Beach. The home was custom-made and quite beautiful. While it's not a must-see in any Maui guidebook, I'll miss its strangeness. Update 4/9/16: This structure has probably been completely demolished and stripped by now. For years, different nonprofits wanted to use it as their headquarters, but the County of Maui finally decided to demolish it. There's nothing quite like the smell of fresh baked bread. It's homey and domestic, along with oatmeal cookies, rubber duckies, and being tucked into bed as a child. Even if you're gluten free or generally avoid bread, you may still secretly enjoy the aroma. Rebecca of Kula makes regular (with gluten) bread using organic flour. She's often hanging out along the highway on Thursdays and Saturdays from 4- 6 pm, although not consistently. It all depends on her schedule. I'd be more exact about where her car is located, but I think there's some weird state law against selling food by the side of the road. People do it all the time, whether it's pasteles (a green banana and spicy pork tamale-like dish) or fresh fish, or smoked venison and pork, and mangoes or lychees when they are in season, but I think one could be busted if the police chose to do so. Jaywalking and drinking alcohol on the beach are also technically illegal but rarely enforced. So I want to share what I think is very cool, but not get her in trouble. Just look for the signs "organic bread" as you're heading uphill in Kula. She says she's there until the bread runs out. We've heard of bookmobiles; this is a breadmobile. Each loaf is $5. Rebecca's been making bread for at least three years and has set up her road side car stand since April. Again, she's not always there, which is probably good, because of the state law I mentioned above. I may end up yanking this post or being more vague about location if I get feedback that she could get in trouble. I don't have a way to contact her either - she says she's either there or she's not there. How very zen. She did say it was okay to take photos and blog about her breadmobile. We tried the rye and caraway despite DH's aversion to seeds in rye bread. He loves rye bread, and I've made some loaves, but they turned out heavy and thick, like killer bread bricks. But the flavor's good. We have also tried the rye bread from the grocery store - which is sometimes hit or miss, and the rye from Rodeo General Store in Makawao. By the way, if you buy the rye from Rodeo General Store, make sure to double check that it's rye bread with the people in the deli. Sometimes the clerks get it wrong. Despite the seeds, he still liked Rebecca's version better than the other store bought breads. So we'll definitely be back for more rye bread, the kind that doesn't dent the counter. Geckos, skinks, chamelons, oh my! This is NOT a gecko, but an anole lizard in the fruit bowl. Geckos also like to hang out here. Will I see a gecko on my vacation? Note to tourists: If you’re staying in a B and B somewhere, a hotel, or in a vacation rental, you will probably not see too many geckos or bugs, because the property where you’ll be staying is, or ought to be, sprayed for pests on a regular basis. There are a couple of companies which offer natural/nontoxic pest control and several which offer the standard kind of pest control. 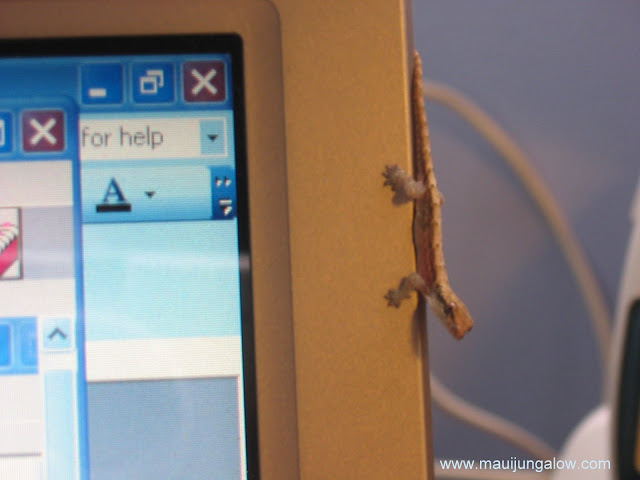 Where do geckos hang out? They like to wander along the top edge of sliding glass doors or sliding screen doors. To my dismay, I have killed geckos simply by opening or closing a screen door too quickly, to find something falling on me or on the floor, in a wriggly kind of way. Sometimes they are lucky, and lose only a tail or foot, but in worse cases, they are rather smashed up, and it’s a disturbing experience especially for the gecko. There is one particular door that I have dubbed the gecko killer since it slides back and forth very rapidly and I have to be cautious with it. Geckos also like to hang out on walls or ceilings, on beams overhead where they can aim their gecko poops on unsuspecting bystanders. They love window screens and windows where there is light, because light attracts bugs. 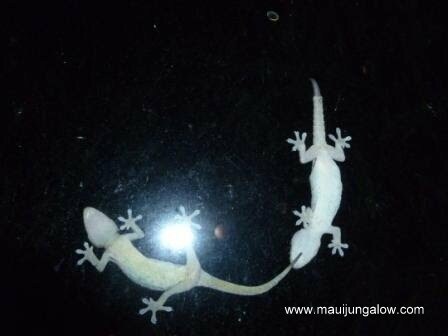 We have one window near the front of the house that gets a fair share of illumination into the wee hours, and I have counted 7-8 geckos at a time. They also hitchhike in the car! A couple of geckos hanging out in the window. Geckos also like my dimly lit Moroccan lantern, and show their delight by pooping plentifully. What do geckos eat or drink? Bugs, bugs, bugs. Even small moths. Part of the reason why it's bad luck to kill a gecko is because it does something useful, eating bugs. I have also caught geckos drinking beer and eating noni flowers or sucking on flower sap! It's very strange and mysterious. I'm sure geckos also drink tap water and rain water, and they may eat fruit. I know that anole lizards eat papayas sometimes. Where do skinks hang out? And what are skinks anyhow? Skinks are another type of lizard that moves very quickly and I think need a lot of moisture. They always seem to be glistening, like they just got dipped in coconut oil. I've never seen them inside the house, but often find them hiding under leaves and on top of my compost pile. They move lightning fast, and I haven't had good luck video taping them. I'm sure that skinks eat bugs, but have never caught them doing so. Skink on top of the cover for my compost pile. The more inquisitive geckos also do a bit of wandering around. I have found them, yes, in my fruit bowl, wandering around the oranges and apples, on my laptop computer and wandering all over the screen and keyboard, on my husband’s hair and shoulders, in the bathtub, in the kitchen sink, even yes, in the toilet bowl. Siri, watch out... Gecko personal assistant here is "ready, willing and able." 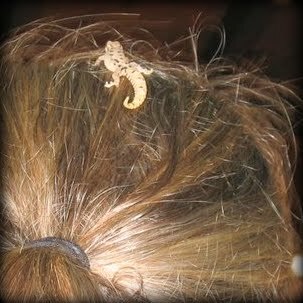 Baby gecko in DH's hair. The baby geckos are more prone to exploring the world in a kind of risky way. Those are the ones inevitably in the sink, the bathtub and the toilet, in a Darwin awards kind of way. What do geckos sound like? Hmm... like a chirp or a bark or a clucking sound... Sometimes a twittering higher pitched sound and some geckos even make scraping sounds when they battling each other in the middle of the night. I have never been able to see a gecko chirping, like it's some gecko rule of quantum physics: You can see a gecko, or you can hear a gecko, but you can't hear and see a gecko at the same time. If the video doesn't show below, here's the link to gecko chirping. Right, I haven't seen any lately, but they do enjoy sunning themselves outside. A friend in Olinda has a chameleon tree where several chameleons hang out. I'm hoping she'll do a series of photos on this. Chameleons are also masters at camouflage and experts at hide and seek. Try to find the chameleon in the jacaranda tree. Baby chameleon held by Alina Rhoades. Geckos, skinks, chamelons, oh my! And don't forget those anole lizards. All part of the aliveness of living in a jungalow upcountry. Is it raining again? That's been the daily question in Haiku. Or the "you gotta be kidding" version of the same question, when the rain clouds are gathering in a tight gray fist overhead, "Do you think it might rain?" As if asking the question would lead to some other answer. Rain makes for lush greenery in Haiku - Monstera or Swiss Cheese plant, elephant ears, and unknown large leafed vine. Our summer so far has proven to be unusually wet. Our neighbor exclaimed, "Wow, I can't believe how wet this summer has been. My rolling papers (which he leaves out on the covered lanai) got all stuck together. All winter long I've left them out and they were fine." Then he remarked that it's time to go back to using envelopes that don't have the sealer on the edges, but the other kind with the removable plastic strip to reveal the sticky part. Since envelopes are getting stuck again. I've heard rumors from old-timers that the last several years - at least eight - have been unusually dry for Haiku. Just not as rainy as they remember it, and that new people ought to be warned that just because it's a sunny day in Haiku, it doesn't mean that's the way the weather is. This is the wettest summer that I recall. It's been kind of bi-polar through most of June and July. Bi-polar meaning the rainy weather has been schizo. In one day, it pours, then stops for 5 minutes and is super sunny, then the clouds come in again, and it's drizzling, then a few minutes later, it's sunny and clear. Like 10-15 times in one day. So offbeat and unpredictable, I'm not sure whether I can start an outside project - like making sun tea or not. So far, August is stepping in on sunny tip toes. This weekend, the weather's been very nice and sunny for both days so far, except for rain at night - which is typical. Maybe we're finally getting some dry summer weather in Haiku.